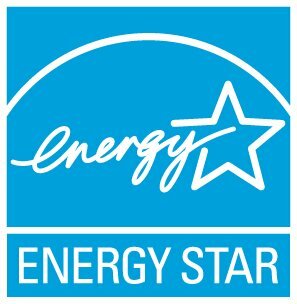 What color light does ENERGY STAR qualified LED lighting come in? ENERGY STAR qualified LED lighting is available in a wide variety of shades of white light, "warm" light comparable to the yellowish light of incandescent bulbs, "cool white" light or bluer "daylight" light. Light color is measured on a temperature scale referred to as Kelvin (K). Lower Kelvin numbers mean the light appears yellow; higher Kelvin numbers mean the light is whiter or bluer. Color for ENERGY STAR qualified LED lighting for indoor residential use is restricted to 3500K or less to provide only warm white light, with the exception of portable desk lamps that can be as high as 5000K where the light just starts to appear more blue as shown in the graph below. To match the color of incandescent bulbs look for 2700-3000K. For a whiter light, look for 3500-4100K. For bluer white light, look for 5000-6500K. 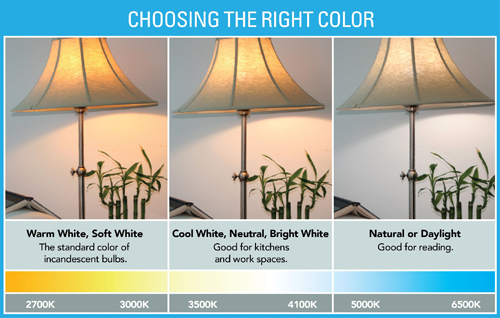 Some ENERGY STAR qualified CFLs have a bluish white hue ("cool") and others seem almost yellow ( "warm" ) in comparison. How can I find consistent colors in lighting? What is the difference between the spiral CFLs and the CFLs that resemble a traditional lightbulb? What's the difference between an ENERGY STAR fixture and a standard fixture (same style/size) using ENERGY STAR CFLs? Is the savings the same if I purchase regular fixtures and use all CFLs? Will ENERGY STAR qualified CFLs fit into my existing fixtures? What is a watt? What is a lumen?